Cinco de Mayo, which literally means the fifth of May, commemorates the Mexican army’s 1862 victory over France at the Battle of Puebla during the Franco-Mexican War (1861-1867). It’a a relatively minor holiday in Mexico but in the United States, Cinco de Mayo has evolved into a celebration of Mexican culture and heritage, especially in areas with large Mexican-American populations. Celebrate Cinco de Mayo with recipes of favorite Mexican dishes. Toss steak slices with seasonings in a bowl. Set aside. Heat 1 tablespoon oil in large skillet on medium-high heat. Add bell pepper and onion and sauté for 5 minutes until vegetables begin to brown. Add the summer squash and sauté about 2 more minutes. Remove vegetable mixture from skillet. Wipe out pan. Add remaining oil. Add beef to skillet and sauté about 5 minutes or until beef is no longer pink. Return vegetable mixture to skillet; season with salt and stir 1 to 2 minutes or until heated through. Spoon onto warmed tortillas. Serve with assorted toppings. Serves 4. Preheat oven to 350°F. Wrap tortillas in foil. Warm in oven until heated through, about 15 minutes. Meanwhile, combine onion and oil in large cast iron skillet. Stir over medium-high heat until onion is golden, about 6 minutes. Add cumin and chili powder; stir 20 seconds. Add bell pepper, corn and carrot; sauté until almost tender, about 5 minutes. Add beans, salsa and spinach; bring to simmer and wilt the spinach. Season with salt and pepper and remove from heat. Place warm tortillas on work surface. Spoon filling down center, dividing equally. Top each with 2 tablespoons cheese, then 1 tablespoon each of sour cream and cilantro. Fold sides of tortillas over filling, forming packages. Turn each package, seam side down, onto plate. Lay a tortilla on a clean countertop or plate and spread half of it with about 1/4 cup of chopped chicken, depending on the size of your tortilla. Sprinkle on some of the optional toppings, and then evenly top this with a generous amount of grated cheese. Add a few drips of hot sauce if you like spicy food. Carefully fold the tortilla over and press gently. Repeat if you are making two quesadillas. Heat a large cast iron pan or heavy skillet over medium heat and spray pan with cooking spray. Place quesadillas in pan like the two halves of a circle. Spray the tops with cooking spray and gently press them down for a minute or so with your hand or a metal spatula. Take a peek on the bottom of the quesadilla with the spatula. (Turn the heat to medium low if it’s browning too quickly and the cheese hasn’t melted yet.) When it is nicely browned, carefully flip and cook the other side, pressing down gently so the cheese melts and the fillings heat up. Remove to a cutting board, cut into wedges, and serve immediately with toppings of your choice. Halve avocadoes and remove pit and with a spoon. 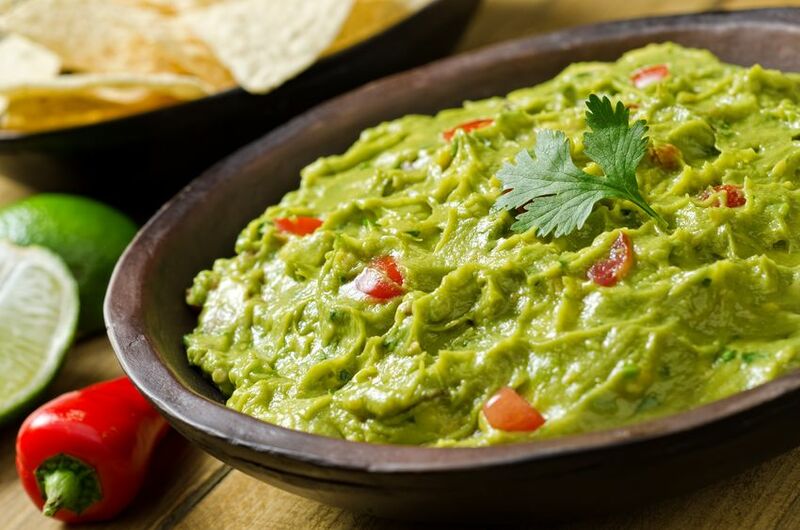 Scoop out avocado flesh into a bowl and mash coarsely with a fork. Add the lime juice, cilantro, garlic, salt and any optional ingredients. Serve immediately with tortilla chips or fresh vegetables. Combine all ingredients in a bowl and let sit for 30 minutes to let flavors meld before serving.